Most of my fellow Brothers are already getting geared-up for BrickCon in October, but at that time of year, sadly, I can get away from work only barely long enough to attend Steam in the UK; a trip to the US is not in the cards. However, in the last few weeks I was in the US for a holiday which included attending Brickfair Virginia. I haven’t yet been home long enough to find the time to go over all the pictures that I’ve taken, let alone to find the owners of the models in them on-line, but will hopefully get around to that in the next few weeks. For now I want to share some of my experiences and to give a shout-out to the military builders I have been hanging out with, specifically Aleksander Stein, Evan Melick, Matt Hacker and Corvin Stichert. 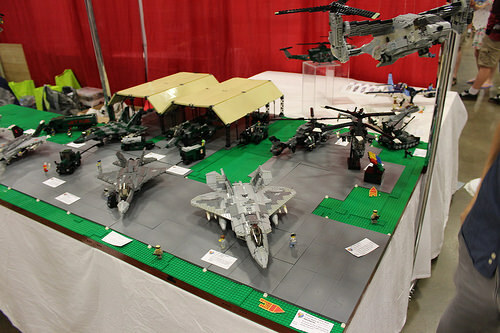 This year they displayed a collaborative airfield layout full of excellent minifig scale (near-future) military aircraft, helicopters and ground support equipment. The event consisted of three set-up days, which were for registered attendees only. There were a lot of organised activities, including games and talks about build techniques, as well as two talks by the guys from Beyond The Brick about their youtube podcasts. I was too busy chatting to other builders while all of this went on, but I did catch an excellent talk by Gary Brooks (whose Battle of Waterloo was featured here a few weeks ago) about building landscapes, that taught me a few new tricks. The set-up days were followed by two public days, during which we all got to display our models to an appreciative audience. I know some exhibitors dread these, and they can get very busy, but I enjoyed talking to the audience and demonstrating the folding wings and undercarriage of my Wildcat fighter. The fun didn’t end at Brickfair. Since all of us share an interest in military history and technology, the next day we hit the road (and thanks to the satnav, DC rush hour traffic on the way back) to visit the USMC Museum in Quantico. 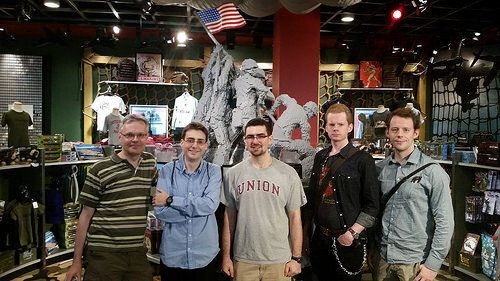 This had a little LEGO twist: its shop features an impressive model of the USMC Memorial by Nathan Sawaya, which was the perfect backdrop for a group photograph. I know that there must be a fair few people among you who have never actually been to any sort of LEGO convention or event. I was like you for a long time. Building with LEGO was something I did on my own. Later I started sharing models online, which added a welcome social component. However, as I found out when I joined Brickish in the UK and started attending events, nothing beats face-to-face meetings with fellow enthusiasts and being able to see their builds in real life. I’d like to thank Magnus Lauglo for inviting me to brickfair several years ago and for offering me a place to crash this year too. Congratulations to our very own Simon for winning four (!) Brickee awards, including best aircraft. Thanks guys, I had a ball. I wish I could’ve joined you guys! Looks like fun! It was fun and would have been good to see you there. Perhaps some other time?